Elementary, middle, and high school students can look forward to educational exploration classes with the blimp. DIRECTV is also holding its own version of “Friday Night Lights,” (#FridayNightFlights) where it will make appearances at some of the biggest high school rivalry games the west coast has to offer. The massive LED screen will display school names, colors, and slogans above the stadium during the game. Students are encouraged to tweet @dtvblimp to get involved. The blimp will be out on the West Coast until March of 2015, and will be sharing photos, video and articles about its school activities throughout its time there, and via social media. You can follow the blimp @dtvblimp on Twitter. (REQUESTS NOW CLOSED). 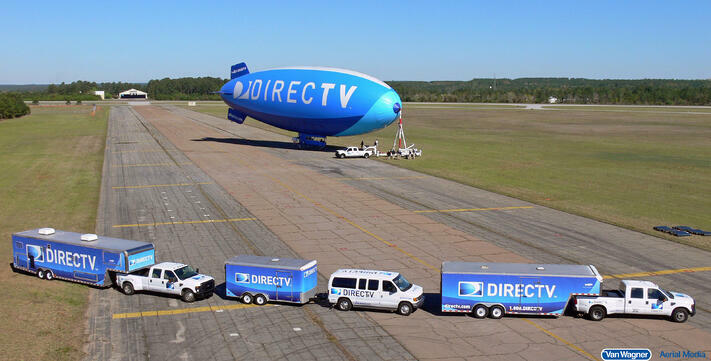 The DIRECTV blimp will be flying in and out of San Bernardino airport when in the LA area, out of Livermore when in the San Francisco area and from Brown Field when in San Diego. Please note: Your school's proximity to the airport is an important determining factor in the blimp's ability to make an appearance! We look forward to speaking with you.